Where is Camp Eagle Ridge? We are located in Mellen, Wisconsin, approximately 23 miles south of Ashland, Wisconsin and Lake Superior. Our campers come from all over the United States and from around the world! In 2017, we had campers from 10 different states. We have had campers from Spain, Germany, Japan, Russia, China, Guam, Switzerland and Italy! We have approximately 90 campers in camp at one time. Its a pretty even mix of boys and girls and age groups. 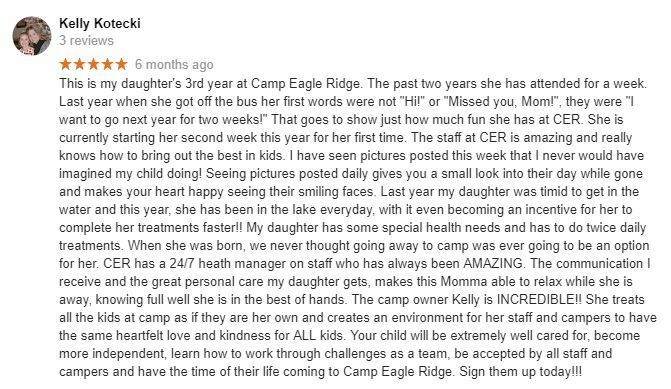 Camp Eagle Ridge boasts one of the highest staff retention rates in the nation. That means that most of our counselors have been at camp for 10 years or longer! Most of our counselors were once campers. They were then chosen to become C.I.T.s (Counselors-In-Training) and then, J.C.s (Junior Counselors). So by the time our counselors become counselors, they’ve been through a two year training program! Our counselors are all over the age of 18 and most are attending colleges and universities throughout the United States. Many of our staff members have also studied or volunteered abroad helping children in other countries. To learn more about each of our counselors, go to our Counseling Staff page! We perform yearly background checks on all of our staff members. Every year, our staff attends a two week training prior to the start of camp. Everyone on staff is certified in CPR, First and AED. What are the cabins and bathroom facilities like? Your child will live in a log cabin with about 6-12 (depending on their age) campers that are close to their age. 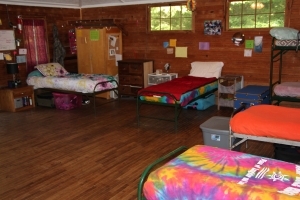 A counselor (or two) and a Counselor-In-Training or Junior Counselor also live in their cabin. Most cabins have a mix of single beds and bunkbeds. Each camper also gets a nightstand/cubby for their bed. There are 5 girls’ cabins and 5 boys’ cabins. Cabins have electricity and fans, although temperatures are generally mild; around 80 degrees during the day and 65 degrees at night. Our bathroom facilities are very modern with private showers and changing areas. Each shower has a private changing room attached to it. Every cabin has a designated shower time so that everyone showers once a day. Campers also have the option of showering during free time. How do you handle Health Care? We have a full time Health Manager on site and every counselor is certified in CPR and First Aid. Our Director is an American Red Cross First Aid, CPR and AED Instructor. We have a fully stocked Health Center with 24 hour medical care on site. Campers receive a health screening upon arrival at camp. At that time, any medications are checked in with our Health Manager and dispensed according to physician’s instructions. Read more about Health Care here. How will they do laundry? For campers that stay longer than one week, we do laundry once a week. Each cabin has a laundry day. As a cabin group, they take their laundry bag to the showerhouse and it is washed, dried and returned by the end of the day. Campers are responsible for checking their pockets and deciding what to wash. We don’t recommend bringing any delicate items that need special washing instructions. Campers are responsible for folding and putting away their own laundry. We go on day trips! Check out some of our trips here! Your child will not need any cash while at camp. You will set up a camp store account for your child’s use while at camp. The store account is used to purchase souveniers and snacks in the camp store and can also be used for any trips that have additional costs, such as: canoeing and rock climbing trips ($10) and other trips (approximately $5 each). Any money that is not used during their session is refunded by check at the end of your child’s session. The motorcoach is used by about 90% of our campers. It has a professional driver and at least one member of our staff onboard to assist our campers. The motorcoach is very comfortable – it has comfortable seating, air conditioning, movies and a bathroom. Everyone dines together in our main lodge and dining hall. We have breakfast at 8:15 a.m., lunch at 12:15 p.m. and dinner at 6:00. Fresh fruit is available all day. Most evenings there is a bedtime snack and ice cream treats and freeze pops are available in the camp store during free time. Campers may purchase up to two treats in the store each day. 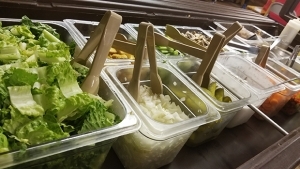 Our meals are delicious and nutritious! We serve a healthy and balanced menu and we are constantly asked to share recipes with our camp families! To learn more about our healthy living skills philosophy (which includes teaching our kids to cook and garden), click here! What kinds of activities will my child get to do? Your child will choose two different activities each day. They will also choose a “Club” each week. Activities include: Sailing, Kayaking, Paddleboarding, Canoeing, Basketball, Soccer, Volleyball, Tennis, Golf, Martial Arts, Archery, Wrestling, Sumo Wrestling, Football, Dance, Drawing, Painting, Outdoor Living Skills, Lacrosse, Rugby, Improv, Kickball, Gaga, Gardening and more! Find out more on our Activities page. How do I communicate with my child at camp? There are two main ways to communicate with your child while they’re at camp: letter writing and one-way email. You can send one-way email through your CampMinder Account. Upon enrolling your child, a CampMinder account is created where you can manage your information and view photos from the summer. “Camp stamps” are purchased through CampMinder allowing the sending of one-way email. These are printed and distributed each morning to campers. We also have “Mail Call” before lunch! Campers are very excited to receive actual letters, so we strongly encourage letter writing from parents, relatives and friends. If you send a package, it is very important that it doesn’t contain food or gum. Food and gum attract critters (we’ve seen an entire family of mice move into a camper’s suitcase over a stick of gum). There are lots of other ways to show your love! If I live out of the United States, how will I communicate with my child? International campers write letters to parents and the camp office scans them and emails them to you. If you would like to respond to those letters, please send your child a one-way email through CampMinder. Should my child bring a cell phone, iPod, iPad, etc.? We encourage our campers to “unplug” for their camp adventure! If they choose to bring a cell phone or other “internet accessible” device, it will be collected upon arrival and stored in the camp office until they leave. We’d really prefer that these devices were simply left at home. Camp Eagle Ridge will not be held responsible for these items. Electronic readers, such as Nooks or Kindles, can be brought and used at camp if they cannot be used for any other purpose.